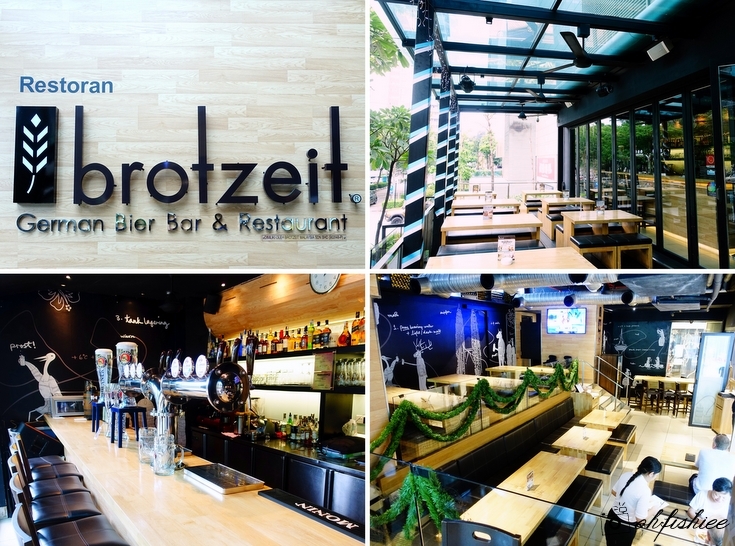 Brotzeit German Bar & Restaurant has been a firm favourite among pork devotees and beer connoisseurs seeking for a satisfactory dinner and after-work drinks, with conveniently located branches in Bangsar Shopping Centre, Sunway Pyramid and Mid Valley. 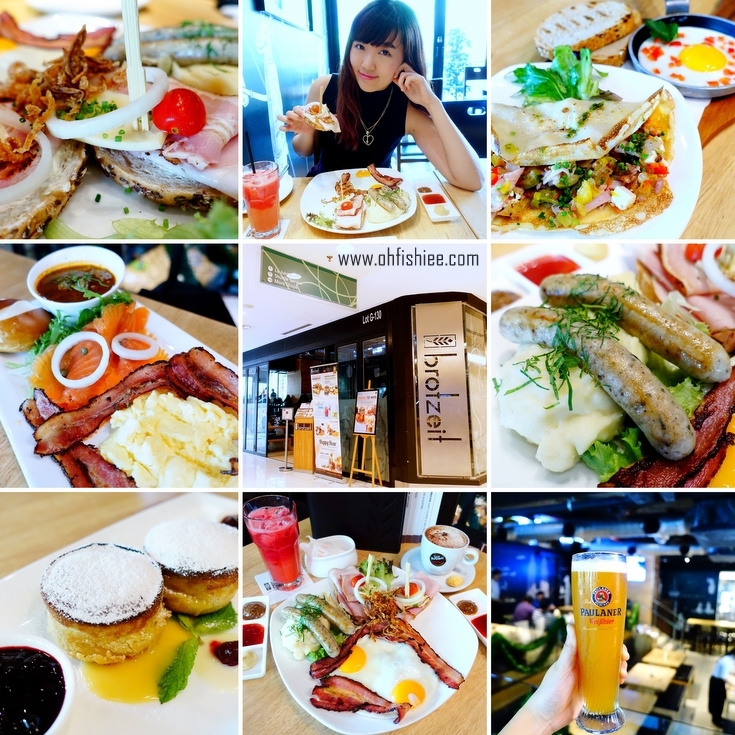 Little do we realise that Brotzeit is also a great place for breakfast/lunch as its Sunday brunch menu features an array of hearty breakfast sets including a cup of freshly brewed coffee or tea. The portion is pretty sizeable, so I am sure you’d love the idea of sharing the platter while you get to enjoy more varieties. Kickstarting our day with a cup of cappuccino and a glass of watermelon juice (Add-on fruit juices @ RM6 each), the crowd’s favourite Brotzeit Signature Breakfast is all we need to fuel the day while satisfying our cravings for hogs. No breakfast set can be more complete than the hearty open-faced sandwiches—Layers of smoky ham, belly bacon, emmenthaler cheese, onions and tomatoes sitting on multigrain bread)—2 sunny side-ups, streaky bacon and Brotzeit’s well-loved sausages. The signature Nürnberger Grilled Pork Bratwurst sausages here are uniquely made using Brotzeit’s traditional recipe. The resulting taste? Extra savoury with delicious crunch. Best paired with the creamy mashed potatoes. I love how the mash exudes strong flavours of milk and butter, while retaining its chunky texture without being too mushy. The hangover breakfast lives up to its name! You’d enjoy this amazing meaty combination of beef goulash soup, bacon and smoked salmon served with a farm fresh omelette (You can choose to have it fried, poached, scrambled etc) and Laugen bread roll. The platter tends to be a tad salty, but trust me, it’d taste just nice on the palate to cure that hangover after a night of drinking. Dip the sweet bread roll into the thick beef stew for a kick of spices that tantalizes the taste buds. If you feel like going for something less heavy, perhaps digging into the soft thin pancake filled with feta cheese, tomatoes and olives with egg (Poached, scrambled or fried) on crisp-hot toasted multi-seed bread sounds like a good idea? However, the feta cheese adds a distinctive salty taste which may not be acceptable for some. To cut through the heavy flavours, we pair it with the house special 0.3 litre bier mixer and the resulting taste is totally well-balanced! At Brotzeit, it is never too early to drink as good food comes hand in hand with delicious handcrafted beer here. The Munich’s classic Weissbier is light, unfiltered and slightly malty with hints of banana. Mango juice adds sweetness into the concoction, making me going for more. Refreshing on the mouth and sweet on the palate, it is safe to say that the taste is acceptable even for non-drinkers. I must make sure that I try the other variation, Weissbier with Banana Juice the next time I visit Brotzeit! Lastly, dessert is here to conclude our Sunday brunch date. Brotzeit’s version of molten lava cake is not what we normally have out there. Encased in the crispy outer shell is the melting hot white chocolate, so creamy, so rich that it puts me on cloud nine. No worries if it seems too sweet, because the tartness from the duo sauces—Forest berry and Australia plum— cut through the sweetness and balance out the overall taste. Seriously, you gotta try this out! and spend your lazy Sunday or Public Holiday sipping on the beer while tucking in wholesome breakfast sets.